Teach Secondary offers advice, inspiration and experience from some of the most exciting and innovative thinkers and practitioners in the sector. 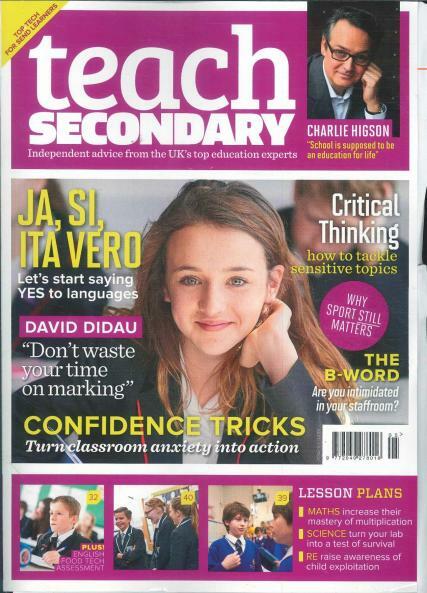 Every issue of Teach Secondary magazine is brimming with ideas to help you with your teaching career. Highlighting examples of best practice, encouraging lively, relevant (and at times, controversial) debate, putting new products through their paces, and providing a regular collection of edgy and original lesson plans that can be adapted for any classroom, Teach Secondary is an essential resource – not to mention an entertaining and enlightening read – for anyone involved in education at Key Stages 3 and 4. Not looking for Secondary, then try Teach Nursery and Teach Primary which are from the same publisher.